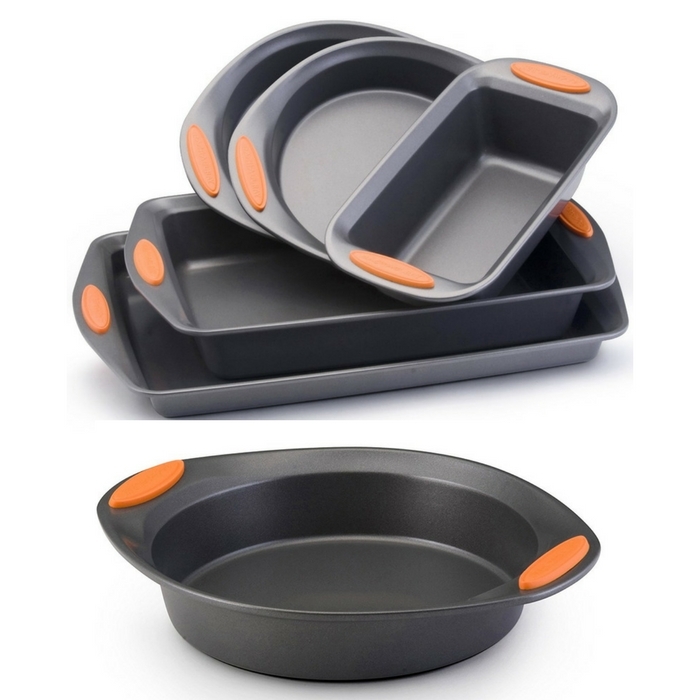 Rachael Ray 5-Piece Bakeware Only $24.40! Down From $38! You are here: Home / Great Deals / Amazon Deals / Rachael Ray 5-Piece Bakeware Only $24.40! Down From $38! Check out this very nice deal at Amazon! Rachael Ray 5-Piece Bakeware is now on sale for only $24.40 down from $38! FREE Shipping with Amazon Prime or $35 orders. This 10″x15″ Cookie Pan is the perfect size for everyday use for baking desserts or preparing a simple dinner. Use it to bake cookies or try using it for Rachael’s “Buffalo Chicken Meatballs” recipe, which is included with this pan. Versatile and convenient, this bakeware features a nonstick interior and exterior that is dishwasher safe for easy cleanup. Includes: two 9-inch rounds, 9-inch by 13-inch rectangle, 10×15-inch crispy sheet, 9-inch by 5-inch deep rectangle. Extra wide handles for a confident grasp. Comfortable silicone grips add a splash of color. Long lasting nonstick inside and out.